I've been seeing this floating around and being published on people's blogs several times recently, and as I love lifestyle and 'get-to-know' kinda posts I thought I'd give it a go. It was actually hard than I thought it would be, hence why it's the almost alphabet because U, V, X and Y I just cannot. April - April is my birth month, April 29th 1996 to be precise. Ben - Ben is my boyfriend, we met at uni, have been together for almost two years and I'm so so grateful for all he does for me. Canterbury - Canterbury is my university city and I love it so much. There's such a good mix of history and a good nightlife for it to be a wonderful uni location, and it's so bloomin' beautiful. Dairy Allergy - I have a dairy allergy, which I have two minds about. Sometimes it doesn't bother me because there are some great alternatives but often I just want cheese ya know. Emily - Bet no one saw this coming, not! But yes, my name is Emily. In school it was such a popular name that I really didn't like it, but now I'm growing up I've become much more fond of it. Farmers' Daughter - My family are farmers, which has ups and downs. I do kind of enjoy some aspects of farming, but certainly not those 13 + hour harvest shifts! Gin - Gin and tonic is my tipple of choice when I'm out for the evening. I do like a good cocktail or a glass of wine, but there's something about gin. Home Comforts - I'm definitely a home kinda girl, it doesn't matter where I am I like to make it feel homely and cosy. Internet - Where would we be without the internet, not writing blogs that's for sure. Jewellery - I'm a big lover of jewellery, especially dainty silver pieces. Kind - I feel like 'kind' can be a pretty standard word, but over the years that's what people tend to describe me as so there you go. Left Handed - I'm a leftie, and although it's meant to be rare or something to be left handed, in my family 3 out of 5 are left handed. Middle Child - I'm the middle child, with two brothers either side. I don't think I really have that middle child syndrome, but the middle child and the only girl was quite a battle as a child! Norfolk Horn Sheep - My family has a flock of Norfolk Horn Sheep, and not that I'm biased or anything they are such beautiful animals. Organised - I like to think of myself as one of those really organised people. I'm probably only organised to a certain extent, but everything has a place, I have multiple notebooks for lists and I can't stand 'organised mess'. Politics and International Relations - Politics is what I study at university, so many people give me odd looks or make silly remarks when I say I study politics, but I enjoy it so much and know it's definitely what I want to do. Quiet - I wouldn't say I'm particularly quiet now, but it does take me a little while to come out of my shell, but when I was in school I'd barely speak at all according to the reports. Reading - I absolutely love reading.I could spend hours in a bookshop choosing which ones to buy and then spend the rest of the day just reading. There's nothing better than the scent of a new book, and I hate to admit it but I love cracking the spine. Suffolk - I live in the Suffolk countryside, it's quiet and beautiful and whilst it'll always have a special place in my heart, I can't really see myself living here all my life. The Great British Bake Off - How can you not love this show?! The Bake Off is one of my favourite shows, and I'm probably more obsessed watching people make cakes than I'd like to admit. Water - Water is probably my favourite drink. I like tea and some other soft drinks, but you can't beat a glass of cold tap water. Zodiac - If I'm being perfectly honest here I don't really understand Zodiac signs too much. I know that I'm Taurus, but what that means I don't know. I just liked the horoscopes in kids comics that told me I'd get sweets that week. 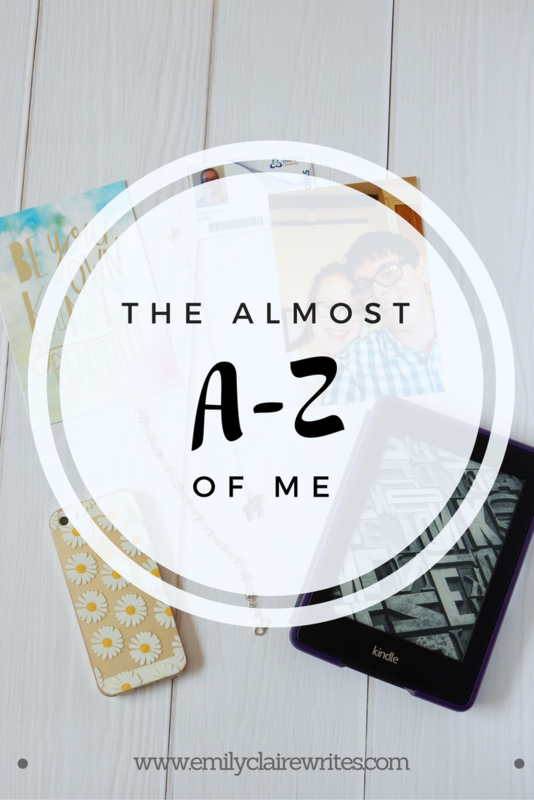 Have you done the A-Z post? Be sure to leave links in the comments!